Kyla Ross, the youngest member of the team, only signed on to do local shows in her home state of California so she could resume school and training. So that left Maroney, Gabby Douglas, who just announced that she will only be doing half of the shows, Aly Raisman, and Jordyn Wieber to represent the team at the rest of the tour stops. But at the Ontario stop of the tour-only the second one of many-Maroney badly injured an already weakened leg while performing a simple layout flyaway from the uneven bars during a group performance on the event. Immediately after Maroney was carried off the floor, Raisman missed her low-to-high bar transition and bruised her knees and also had to leave the show (though under her own steam). Is this all just terrible bad luck? Mostly. But as many spectators noted, the girls were not performing on a podium, which is bouncier and softer to land on. (This is the setup you see at major competitions.) They were performing on mats set over concrete. This is a much harder landing surface than the girls are accustomed to. Though it would be very difficult and costly to build a podium at every single tour stop, some spectators reported that the mats looked a bit shorter than the elite competition mats. That taken together with Maroney's preexisting condition-she reportedly had been dealing with a fractured fibula in addition to her toe problems-and dropping several feet out of the air onto a hard landing surface, even on a simple skill, proved too much for Maroney's leg. Aly was up so she went on (she might have been doing a sort of synchronized routine with Gabby who was on the other one) but during one of the releases onto the high bar (or off of, I was watching Gabby at the time) I'm guessing she didn't catch it because I saw her fall and land on the mat behind the higher bar, only there wasn't enough mat behind it because when she landed face first, her legs smacked against the concrete floor of the arena behind it. I could hear it from where I was sitting. I'm pretty sure my heart stopped. Despite the scary sound, Raisman's injury was minor and she'll be able to rejoin the show for the San Diego stop of the tour. 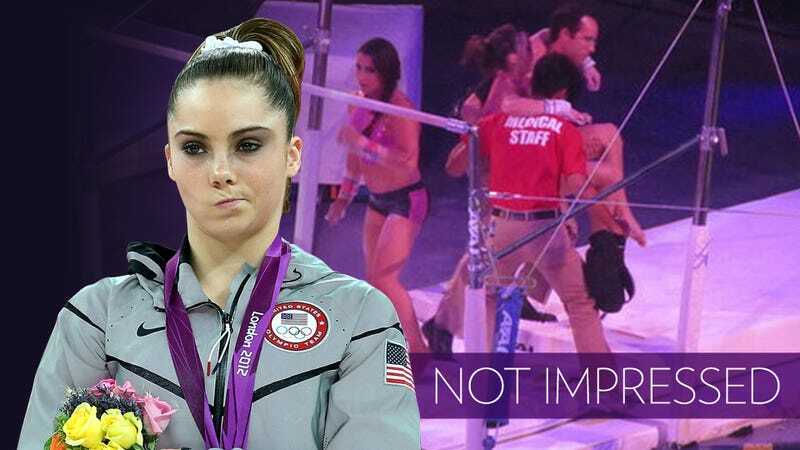 Maroney, however, will not be performing again anytime soon. Here's the statement that USA Gymnastics released about Maroney's injury. On Sept. 9, 2012 Olympic gold-medalist McKayla Maroney was injured on her uneven bars dismount (single flyaway) at the Ontario, Calif., performance of the Kellogg's Tour of Gymnastics Champions. Maroney's MRI showed a fractured tibia on her left leg, and she is currently in a brace to keep the leg stabilized. Is there a lesson for organizers in all of this? Though during the tour, the athletes do not perform at their full difficulty levels, the padding still needs to be adequate. Especially since many of the athletes are physically beat down from the whole Olympic preparation and competitions, and have just spent several weeks away from training and are no longer in the tip-top condition they had been in August. Also, with the gymnasts' personal coaches back home instead of supervising their athletes' preparation and training while they're on the road, organizers should be erring on the side of extra mats and protection for the stars of the show. Dvora Meyers is a freelance writer based in Brooklyn. Her work has appeared in The New York Times, Slate, Tablet and elsewhere. She writes about gymnastics and Judaism at Unorthodox Gymnastics, and she is the author of Heresy on the High Beam: Confessions of an Unbalanced Jewess. She blogs about woman-y stuff over at The Anti-Girlfriend. Lede image via Sadder But Wiser and Getty.